FOREX TRADING GUIDE: WHAT ARE THE BEST DAYS IN A WEEK TO TRADE FOREX ? 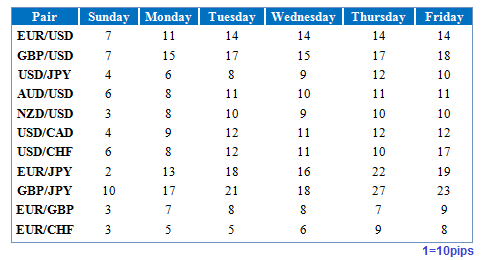 WHAT ARE THE BEST DAYS IN A WEEK TO TRADE FOREX ? Every traders dreams to be a Millionaire through forex trading, who does not at least choose a average daily profit target.Smart traders who adequately know the behavior of the market in the 5 days of a week, they plan to achieve an average daily pips target instead of daily fixed pips target. Why selecting fixed pips target is not logical ? The simple answer of this question is that the volatility in the forex market is not equal in all days of a week. 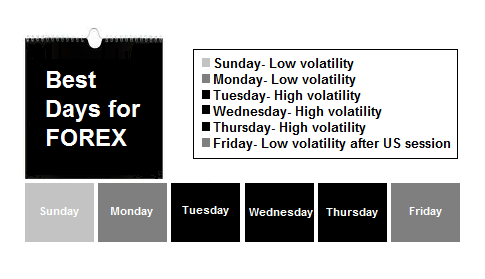 Let me explain you how and why volatility varies among the days in a week. Sunday: Sunday is a bad day for forex traders because on Sunday market opens and few number of economic data are released on the day. But some Sundays can be different than other Sundays in special circumstances. Monday: Monday is better than Sunday, but still the currency pairs show less volatility because of the few economic data are released. Tuesday: A huge number of highly important economic data are released on the day and market shows high volatility. Wednesday: The already released economic data on Tuesday and the new economic data released on the day supply huge volatility to the currency pairs. Thursday: The already released economic data on Tuesday and Wednesday and the new economic data released on the day supply huge volatility to the currency pairs. Friday: It is the closing day of the market. Previously released economic data on the days followed by Friday provides volatility in the currency market. But after the US session currency market calms down to count down the closing. The image below illustrates the average daily pips movements by some of the major currency pairs and currency crosses. From the above image, we can easily understand the hot and cold days of the forex trading. Four days of the week except Sunday has mentionable average pips movement to gain targeted profit. Sunday is really a calm day. Why you should select an average daily pips target ? My average daily pips target is 50, and I consider it as the ultimate success as a forex trader, if I can gain it consistently. If on a Sunday I can gain 50 pips, this is an excellent performance to me. Generally, I target 30 pips on Sunday and 55pips on the other 4 days in a week. On some good days, I cross my target and give a big smile. Not only on Sunday but also on the holidays in big economies can make any day of the week calm and quit. Dear Traders, these are the behaviors of currency market in the days of a week. You should have clear ideas on this to successfully achieve your daily goal in forex trading. If you have any comment, just drop it below.